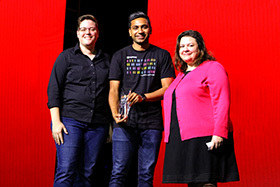 The Strata Data Awards recognize the most innovative startups, leaders, and data science projects from Strata sponsors and exhibitors around the world. Curated by a team of industry experts and selected by the attendees of the world’s largest data conference series, the Strata Data Award is given to the most disruptive startup, the most innovative industry technology, and the most impactful data science project. Visit the Expo Hall and vote for your favorite startup, product, and initiative by texting your vote to 22333. (Specific text-to-vote codes will be listed on signage at each finalist’s booth). 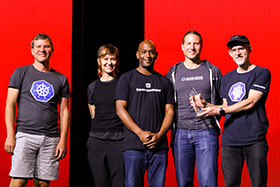 Strata New York attendees can text to vote for the three winners of these new awards. See above for text-to-vote instructions. There will also be signage onsite and on slides during the Wednesday keynotes that list the specific texting instructions. Don’t forget to visit the finalists in their booths on Wednesday to learn more before you vote. Winners will be announced during keynotes on Thursday.